The history begins in 1934. In this year the founder, Pietro Scaglione, is 28 years old. He is just moved on Ischia because it is here that he has met and is fallen in love with the ischitana Assunta Trani; after a few months, he marries his lover. So, he decides to open a woven’shop: for a long time, Pietro has been responsible of a shop of draperies in Naples, the city where he was born, and now he is sure to have already acquired the appropriate experience to start a commercial activity like this. For the first 20 years the center of his business is in a shop in via Roma, the historic town center of Ischia. Then, in 1953, Scaglione opens a new corner in via Alfredo De Luca, that during those years was a peripheral road, showing to be a brave and on the cutting edge man. In this new location, Pietro inserts a sector of underwear and household linen ; after that, he creates a small section of the new born sector called "confezione", and he combines it to an organized service of tailoring outwear for man and woman that quickly becomes successful. After 20 years, in 1973, he believes that the moment has come to retire from the business and it surrenders the activity to 3 of his 10 children. This second generation gives to the company a new dimension and a different identity: the corner shop is refreshed and the attention is focalized on the fashion world, inspiring to the principles of quality and style learned by their father. At the end of 1980s, only the younger of the three brothers, Gio’, continues the activity: along with him, the third generation is playing its part. Gio’ decides to respect the family tradition but, at the same time, to manage the company in a more modern and dynamic way, keeping a high standard that makes Scaglione a landmark in Ischia’s fashion world. In 1991 Gio’ founded with his nephew Pietro the “nuovo gruppo Scaglione”: they together convert the historical shop of 230 mqs. in a modern multibrand-store organized in several sectors, where, in addition to the classical line, there are trendy and sportswear clothes. But the most important change for this company is the creation of “Atelier dello Sposo”: Scaglione becomes the only store in Ischia specialized for ceremony, where it is possible to find the best brands of the sector. Giò Scaglione intuisce l’importanza della specializzazione e del servizio, nel segno della qualità e dello stile ereditati dal padre, quali punti cruciali di una filosofia aziendale in cui il cliente diventa ed è sempre il protagonista assoluto. In questa prospettiva, ogni anno, chiede ai collaboratori di impegnarsi in stage di formazione in tecnica manifatturiera, vendita e visual merchandising. In the 1990s, another exciting phase starts: new openings along the most chic roads. Today the group Scaglione includes, besides the historical shop an exclusive woman boutique the "Glamor" women's boutique that overlooks the shopping street for excellence, the C.so Vittoria Colonna. Moreover on the C.so, there is the original "Scaglione-Alternative" store that sets the trend and is aimed at a younger and more attentive audience. Finally, always on the main course there is "Scaglione Casual" exclusive Gant and Brooksfield store, a store dedicated to the casual universe; present in the men's clothing store and accessories. Instead, in the historic square of Santa Restituta in Lacco Ameno, here is the "Scaglione-Upper" man-woman boutique, dedicated to luxury brands and Made in Italy craft products. 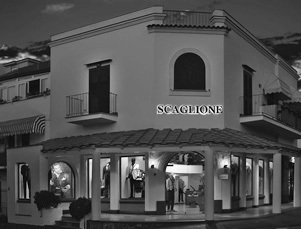 Also on the main road of Ischia, Scaglione manages two exclusive mono-brand shops, each one aimed at a different consumer. In Via Roma, the dynamic "Geox", a sales point designed for the whole family; there are both the lines of footwear for men and women and children and the clothing lines and accessories for men and women, all obviously with the famous patent that allows the garments to breathe. Last but not least, just a few steps away is the exclusive "Red Valentino" women's boutique, an architectural jewel with its modern and suggestive open-space windows that frames the famous designer's collection.